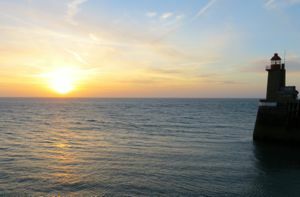 I love water views, and Fécamp offers several beautiful ones. We checked into our hotel in Fécamp, and I immediately headed to the balcony to look out over the port. I could happily have stayed there for hours, but there was more to see in Fécamp. Above, View across the port to Cap Fagnet, Fécamp. From the port you can take an excursion boat to nearby Étretat, another beautiful beachfront town. Fécamp also has some notable churches, including the Église St-Étienne, historically the church of the fishermen, and the Abbatiale de la Ste-Trinité. The narrow streets of the town wind around the other neighborhoods, offering a glimpse of life in a small seaport town. 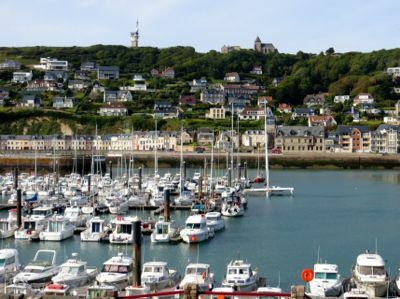 Across the port from the main part of town is Cap Fagnet, whose high hill offers beautiful views of the town and the English Channel. The small Chapelle Notre-Dame de Salut memorializes sailors who have died at sea. You can walk to Cap Fagnet and the chapel from the town. You won't find Fécamp on a lot of major tourist routes. It's a bit à coté, or off to the side, which is part of what we enjoyed about it. 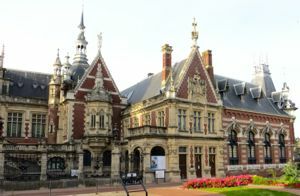 Here's how to go to Fécamp.